Jewelweed, Impatiens capensis, is a common native plant found in moist places. Jewelweed, Impatiens capensis, is an annual plant in the balsam family (Balsaminaceae) native to northern and eastern North America that also goes by other common names including orange balsam, orange jewelweed, spotted jewelweed, and spotted touch-me-not. The species name capensis, meaning “of the cape”, was applied because its origin was mistakenly thought to be from South Africa. It is common and widespread in moist, shady areas such as low woodlands, margins of bogs and marshes, along streams and lakes, in ditches, and in disturbed areas such as road cuts. Impatiens pallida has larger yellow flowers with a shorter nectar spur. It is often found near the related but less common yellow jewelweed or touch-me-not, I. pallida, that is very similar but has larger yellow flowers with a shorter spur and tends to be a larger plant. It was taken to England, France, and other parts northern and central Europe in the 1800 and 1900’s where it naturalized readily and is quite similar to I. noli-tangere, native to Europe and Asia. Native Americans used the muciliginous sap medicinally, applied topically to relieve itching and pain from hives, poison ivy, stinging nettle, and other skin problems. The sap has been shown to have fungicidal properties and has been used topically to treat athletes foot. This self-seeding summer annual germinates in early spring and grows two to five feet tall by mid-summer from a shallow branching taproot. The somewhat weak, brittle stems are smooth, almost translucent and succulent and range in color from pale green to reddish green. Some plants have swollen or darkened nodes. The alternate, bluish-green leaves are oval-shaped with coarsely toothed margins for a scalloped appearance. Although they can get up to 5 inches long, the leaves are usually about 2½ to 3 inches long. Sparkling droplets of rain or dew beading up on the smooth leaves may be the source of the common name of jewelweed. L-R: Jewelweed seedlings, young plant, blooming plant, stem with swollen nodes, leaf with scalloped margins and another leaf with beads of water. Jewelweed begins blooming in mid-summer and continues until the plant is killed by frost. The unscented, inch long flowers are bright orange to orange-yellow with variable amounts of red-orange spots and markings. Occasionally the flowers may be pale yellow to almost white, or may be unspotted. The two-lipped flowers have 5 petals (even though it looks superficially like only 3) and three sepals, with one sepal that is the same color as the petals modified into a large cornucopia-shaped pouch with a nectar spur at the back that curves underneath the rest of the flower. The upper lip is formed from one petal and there are two lateral petals, while the lower lip, with two fused petals, forms a landing pad for insect. Jewelweed starts blooming in the summer (L), with variable amounts of spotting on the fused petals of lower lip of the flower (LC, C, RC) and one of the sepals the same color as the petals forming a nectar spur that curls under the flower (R). These solitary flowers, each hanging on its own slender stalk in a widely-spreading small cluster (raceme) of 1-3 in the axils of the upper leaves, are attractive to bumblebees and other long-tongued bees, butterflies, and hummingbirds (the main pollinators) and must be cross-pollinated to produce the elongated pendant green fruits (which are toxic if ingested). When ripe, the five-chambered capsule bursts explosively when touched as the spring-loaded sections of the capsule roll back into tight curled strips to forcibly eject and disperse the 4-5 green seeds (which is where the name ‘touch-me-not’ comes from). There may also be small, inconspicuous flowers produced in the fall at the bases of the leaves that fertilize themselves without ever opening (cleistogamous) and produce small seeds. These seeds produce much smaller plants than those from the large, showy flowers. Pollinated flowers form a fruit (L) that when mature (second from left and LC) bursts (RC) leaving the curled up sections of the capsule (second from R) and forcibly ejecting the green seeds (R). Jewelweed can form dense stands. Jewelweed often forms large, dense stands and outcompetes many other plants – even the non-native invasive garlic mustard, Alliaria petiolata – when growing under optimal conditions. It can be a good addition to native plant gardens in moist, partially shaded areas or added to shady rain gardens. 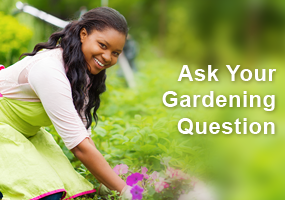 It can also be used to fill areas and suppress weeds, and once established will continue to return every year. Jewelweed grows best in moist, humusy soil in partial to full shade, especially along the margins of water. 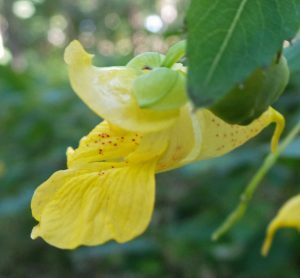 While jewelweed generally has few pest problems, deer will browse the foliage, while mice and many ground birds eat the seeds. Unique little plant, almost looks like a miniature orchid. Very nice article. Had no idea this plant could hold its own against garlic mustard. Might be worth planting ! As I continue to learn about medicinal qualities of plants I found the information about skin irritation etc very interesting. Looking forward to checking my natural spring woodland areas for this plant & perhaps adding some to our pine stands. Great article especially for those folks who hike in woodlands or trails. It does really relieve itchy spots on your skin from any plant that you might walk into along a trail. Some people think it is over powering as a plant; personally I love the plant and see it growing along the road sides and woodlands and marshy areas. I have not seen deer eating the plant but have noticed deer standing in an area filled with Jewel Weed; perhaps it keeps bugs away from the deer? I can contest to the sap healing the stinging nettles bite. It sure did help when I grabbed a bunch by mistake. It’s also nice to know it keep garlic mustard at bay. I’m for anything that does that. I was not familiar with this plant until I read the article. Very informative. I will be looking for when I walk in the more wetter areas than the gravel hill I live on! This is a beautiful plant for pollinators; however, I am uncertain whether or not I would add this to my garden due to the prolific spread of the seeds. I am having a big problem with another impatient plant, that is incredibly invasive Balfours -Touch -Me -Not, a plant that is listed on the Wisconsin DNR list as invasive. I’ve noticed a new weed in a shady area and have been trying to keep it pulled out. The foliage looks like this, but I think the flowers are yellowish I’ll have to check more closely because if it is, I’ll let it be. I found it interesting in that the sap is used for poison ivy and athletes foot. We have some growing by our pond, but ours isn’t really invasive. I enjoyed this article. I have some done some hiking in the woods of Wisconsin, but haven’t encountered this lovely flower. Perhaps it isn’t wet enough where I’ve been. I am glad they are available for pollinators. I am wondering if there are any domesticated versions of this? We were just discussing weeds growing under our spruce trees and how you better manage them. I think the jewel weed plant might be our answer. Great article! This plant almost makes me wish I had more shade areas. It seems to be the best of both worlds: grows in shade and supports pollinators. I really appreciate the illustrations in the article. Both colors of the jewelweed plants are so delicate and warming. It was the first plant the japanese beetles went to this year. Even though I know many wild flowers, I had not met this plant until I moved into our new house a few years ago and it came up thick as the hair on a dog in my flower bed. Thinking it was a weed, I asked my neighbor if he had any in his yard. I then discovered this useful shade plant. I transferred a few to another shady area and the following year had a forest of plants in that area. Everything went well until this summer when the drought hit. Used to growing mostly natives, I rarely water anything and the jewelweed eventually succumbed to the drought. I am hoping that enough seed from the previous year survived that it will return on its own next year. I learned that it is not a drought tolerant as most natives. I think the flower is interesting that it has so many petals (5) and one is designed to be a landing pad for pollinators. This sounds like something I need for a difficult to manage wooded area at the back of one of our lots. Not a plant I was familiar with—but I’m always on the lookout for plants that do well in the shade since that’s most of our yard. Am going to give Jewelweed a try next year. Have enjoyed this plant for years without knowing anything about it. Will definitely try it on insect bites next summer. Such beautiful flowers! I’m for anything the hummingbirds like. Lovely little flowers in both yellow and orange! Did not know it was used to treat athletes foot! Read for edu hours. I am amazed that it out competes Garlic Mustard which is very invasive! Great news for people battling the mustard plant. Thank you for info. Interesting article..did not know that these flowers were self seeding. I have been looking for jewelweed in the bog area at Boerner Botanical Gardens…seems whenever I volunteer there, the plant is diminished. Being in the impatiens family, the “popping seeds” are one example we try to show the children on our garden walks of seed dispersal. Still trying to see some! I have battled Yellow Jewelweed for over 10 years, trying to keep it at bay in my woods opening. It is so prolific! But this article is making me think that maybe I should be more accommodating to it. I might even take some seed (if I can capture it) to the irritating garlic mustard patches along our road where the dogs track seeds around as they walk with their owners. I did not realize that so many pollinators, especially hummingbirds utilize it. Now if only I could be sure it would dominate over my Canada Goldenrod! What a beautiful flower. The grow wild near our home, especially in mashy areas. The kids used to love to “pop” them. I always wondered if they were related to impatiens. They look very similar in leaf and brach structure. I agree the medicinal properties are very interesting! Also nice native alternative to garlic mustard. Jewelweed is totally new to me. We have a small wooded area at the back of our lot with some grassy areas that I would love to replace with something like this. With this being a plant that likes wet areas it may not work. 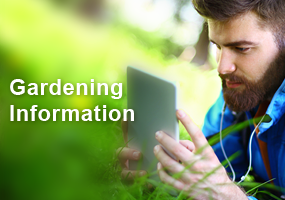 Great information expanding my plant knowledge. Read for edu hours. Beautiful plant. I was interested to learn that it would be appropriate for a shady rain garden. This is a most interesting plant. I had always found it to resemble a snapdragon but on further study find it much more interesting with it’s anti itch and fungicide properties. It also developes large groupings to help force out undesired weeds like garlic mustard. Using it as a ground cover in semi shady areas is also beneficial. The water droplets on it’s waxy leaves giving it the “jewel weed” name is most interesting. They almost look like snap dragons. Love how colorful they are. Read for education hours. Can these seeds be collected this fall and saved until spring? Or should they be scattered right after collection – like today (9/28/2018). They will be spread to a lakeshore area that periodically floods. I always have a lot of the yellow jewelweed on the edge of my woods every year. But this year it was really prolific and migrated into my gardens. The good thing is that the root system is shallow and it is easy to pull up. 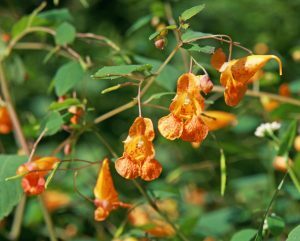 And I learned from one of our Crawford County Master Gardeners (Carley Borcherding) this summer that jewelweed has medicinal values, too (as was related in this article). 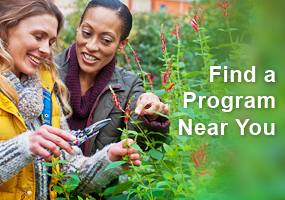 Break the stalk and use the sap from it to treat poison ivy, stinging nettle and bug bites (like bee stings). At a meeting that we had in my gardens, one of the MGs had gotten a bee sting on the way to the meeting. Carley yanked a plant from the edge of my woods, broke the stalk and offered it to her to rub on the sting. By the end of our meeting she said that the sting was gone. This plant is found in moist,shady areas as well as on edge of woodlands and bogs. It was interesting to learn how productive it is out performing even garlic mustard that we all spend hours eliminating. Something to think about. 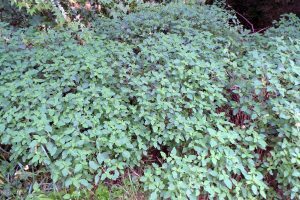 Its medicinal properties can have an impact on itching from poison ivy, nettles, and even act as a treatment for athletes foot with its fungicidal properties.